WINE - what does it mean to you? but stamped its lingering forever fist in my face to which leads me here. 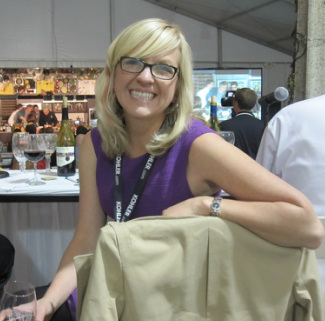 I am currently a Wine Educator, Sales Person and Key Account Manager for General Beverage. I've been blessed to be able to travel, eat and drink wine around the country. I taste to live and live to taste. I have eaten and drank my way through my 20s happily and made memory after wonderful memory. I've always said and believed my 30s were going to be the most amazing of my life and so far........not bad! In 2007 I traveled to Las Vegas, Nevada and went through my Introductory Sommelier Course through the Court of Master Sommelier Program. I really went because work was going to pay and it was at the Bellagio. It was another excuse to go to Vegas and eat and drink my way through as many restaurants as possible. And I did. Oh yeah, and I passed. I drank a glass of champagne that night, followed by a bottle of Seghesio Sonoma Zinfandel, the wine that put me in this spot, the wine that I tasted and it changed my life. I was by myself. Its amazing to sit alone and be proud of yourself. In 2008 I decided to also start the Master of Wine Program. I took my Certified Specialist of Wine test in Chicago and passed with a pretty high score. I was the last person to finish. It took 3 weeks to find out results. I remember that Saturday morning walking to the mailbox, my 2 dogs by my side and Dickie, my kitty, trailing behind - I opened the mailbox and started flipping through the mail and there it was. I was afraid to open it. I slowly did right there in the driveway and celebrated with the dogs, they jumped around like they knew what was going on, proud of there mama. Dickie ignored me. That night I drank Quintessa. A good night. In 2011 I traveled to Seattle, WA to take my Certified Sommelier test. I was more nervous than usual. I felt ready one second and then next I was fighting to remember how long vintage champagne was aged. Being in the same room with 30 other suits, who all seemed so confident and ready, was intense and humbling. After the long day of testing and waiting, we all filed into the room, were offered a glass of champagne, and were told to pick up an envelope with our name on it. As everyone ripped open there envelope I sipped on my champagne and savored the tight bubbles and its toasty, yeasty finish. It made me feel better. I didnt think I passed and had already looked up where I could take the next test. Ohio. I hate Ohio. They started the pin ceremony and I still hadnt opened it. Through all of this I felt eyes on me, one of the Master Sommeliers noticed I had not openend my envelope. Our eyes met and he looked at my envelope, silently telling me to open it. After the 3rd time this happened, I slowly openend it and through a haze realized all three categories had a "passed " by it and on top said congratulations. I was completely stunned. Our eyes met and he smiled. I tipped my glass of bubbly at him in a cheers and childlishly slammed my champagne. Never tasted better. 35 seconds later they called my name. I went up and shook hands, accepted my pin, and then went and poured myself another glass. I left as stunned and happy as I had ever been. I earned that pin. I studied hard alone. I poured many glasses of bubbly to my girl Christina and sniffed everything from bananas to sulfur. That night I drank Roederer estate Sparkling from Anderson Valley, a personal favorite, with my best friend from kindergarten at the base of Mt Rainier. Through out the years I have done many fun and educational things like teaching a wine course at the University of Wisconsin Oshkosh. I have done hundreds of wine tastings and dinners and I have spoken at many different charity events, restaurants and wine bars. I have traveled to Wine Areas all over the Country - Napa, Sonoma, Mendocino, Lake, Central Coast, Santa Barbara, WI, New York, Virginia, Canada (Niagara Region), Oregon, Washington. Also to Spain and Italy. I go there on Business and more importantly on pleasure. It never gets old, It never gets boring, and I hope to live that life everyday......soon. Cooking - another thing I love - and hand in hand with that is gardening. I love plants, vegetables and flowers. Hiking, Biking and anything outdoors..